This is a noisy, rapid, funny and very annoying game. It's a good way to get to know people. Count the number of players. Say 12 people. 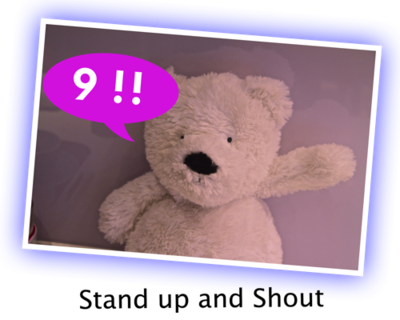 Now randomly stand up and shout out numbers from 1 upwards, until you get to 12. You can't stand up twice. You can't stand up and shout at the same time as someone else. Last person up is the loser. So you count the number of players. There's one objective: to count up to this number. Anybody can start. Every person can shout out ONE number only and must stand up when they do it. Although the numbers must be shouted out sequentially, there is no order around the table. Anybody can shout out a number at any time. - You may not call out a number someone else is also trying to call out. If you stand up to shout out your number at the same time as someone else this qualifies for a forfeit. - If you are the last person to stand up and shout, you lose. Obviously, because people don't want to get caught calling out the last number, there is a sense of urgency. There will be many conflicts where two or more people try to stand up and shout at the same time. With a group of 10 or more it's unusual to actually get to the last number. If you are playing in public, be aware of other peeps. This game can be particularly irritating! a lot more fun with more people! THIS GAME IS SO FAB!!!!!!! we played this in drama once and got up to about 50! my parents got so annoyed by all the noise( we did it it the middle of the night) but is a really fun game!